"YOU'LL LOVE THEM ALL FOR GIVING YOU THE SWELLEST TIME YOU'VE EVER HAD!" You Can't Take It With You is based on the play of the same name by George S. Kaufmann and Moss Hart. It was directed by Frank Capra and won two Oscars for Best Picture and Best Director. In the movie, a man from an uptight wealthy family becomes engaged to a woman from a family of friendly eccentrics. The two love each other, but are worried about potential problems with in-laws. They therefore arrange to have their two families meet. As the movie is a comedy, this goes about as well as can be expected. 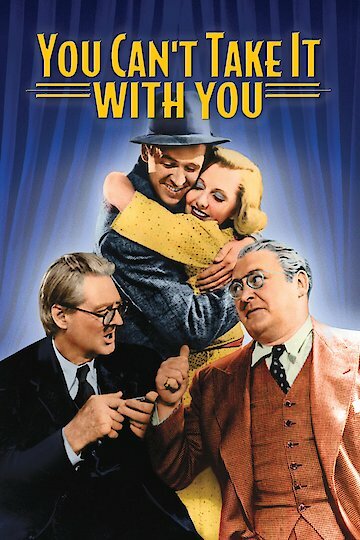 You Can't Take It With You is currently available to watch and stream, buy on demand at Amazon, Vudu, Google Play, FandangoNow, iTunes, YouTube VOD online.